"Medicine at a Glance" provides a concise and accessible introduction and guide to the core curriculum for medical students. Following the familiar easy-to-use at a Glance format, each topic is presented as a double-page spread with key facts accompanied by clear tables, illustrations and diagrams encapsulating all the students need to know. 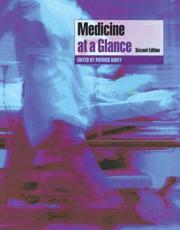 This new edition of "Medicine at a Glance": is fully revised and updated; The essential purchase for medical students; has a unique structure, divided into over 65 clinical presentations and 150 common diseases; covers the essential facts for the diagnosis and treatment of common symptoms and conditions; includes 7 new chapters, dealing with topics such as: how to recognise the critically ill patient - painless loss of vision/blindness, allergic reactions, imaging in respiratory disease, imaging in gastrointestinal disease; and presents diagrams and illustrations on the left and concise explanations on the right, providing a user-friendly overview of Medicine. "Medicine at a Glance" will appeal to all medical students and junior doctors on the Foundation Program, as a core textbook and as a revision aid. The book is also suitable for those training in allied health professions such as nurses and paramedics. Reviews of last edition: "I definitely recommend this book to all final year students..."Final Year Student, GKT March 2004 "I can, with complete confidence, recommend this book to all Final Year students. Its got everything you'll need for Final MB Medicine." - "Amazon Reviewer", November 2003.